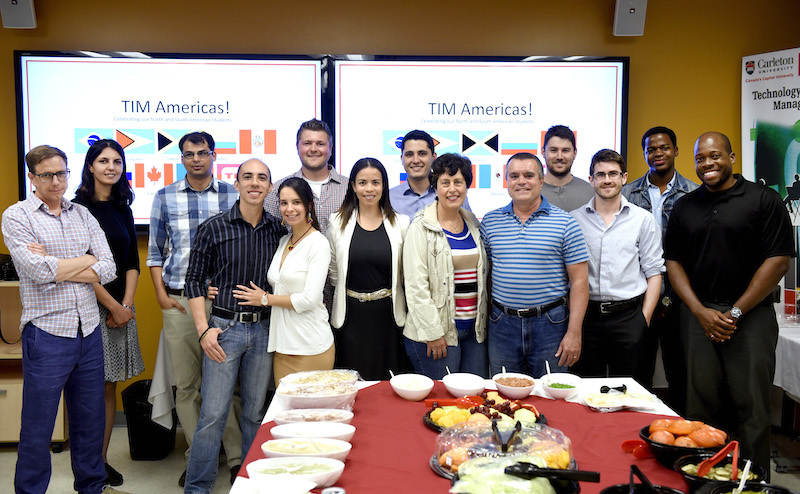 More than 50 people celebrated the accomplishments of students in Carleton University’s Technology Innovation Management (TIM) program who hail from North and South American countries.Thirteen students got the chance to speak about their business opportunities and research accomplishments at the June 11, 2015 event at the university’s Accelerator – a unique space for entrepreneurs.The TIM program includes students from several South American countries, including Venezuela, Brazil, Columbia, Guyana and Peru. Besides Canada, Jamaica and Mexico are represented in North America. The students are involved in projects as diverse as mobile payment solutions, threat modelling and online food ordering.“The TIM Program has always had strong ties through the Americas,” said Tony Bailetti, who established the program. “This event allows us to demonstrate to the community how those connections continue to grow. To say that we have students with heritage in eight different countries is phenomenal. The students are recognizing the power of these connections as well. They are capitalizing on the fact that many of them speak multiple languages and can help move a venture into the global market quicker.”TIM is a unique master’s program for innovative engineers that focuses on creating wealth at the early stages of company or opportunity life cycles. It is offered by Carleton University’s Department of Systems and Computer Engineering. The program provides benefits to aspiring entrepreneurs – engineers seeking more senior leadership roles in their companies and engineers building credentials and expertise for their next career move.